At least Gwen has plenty of help. Her best friend Lesley follows every lead diligently on the Internet. James the ghost teaches Gwen how to fit in at an 18th century party. And Xemerius, the gargoyle demon who has been following Gwen since he caught her kissing Gideon in a church, offers advice on everything. Oh, yes. And of course there is Gideon, the Diamond. One minute he’s very warm indeed; the next he’s freezing cold. Gwen’s not sure what’s going on there, but she’s pretty much destined to find out. Pride and prejudice with a twist! Great from start to finish. Had me at the edge of my seat! Magic, love, time travel, conspiracy. For YA yet intriguing and complicated enough! What a great time travel series! It is clearly for the YA reader but still intriguing and complicated enough to keep me going. I will certainly read the last one! Gwynneth, in my opinion, is a realistic 16 year old, with her immaturity, naivety and interest in boys. I can relate to that. I remember that. Like yesterday, actually! In contrast, Gideon is the complete opposite of a realistic 18 year old boy. However, I am pretty sure that is the point. The story arc between book 1 and 2 was very smooth and brought the plot to exciting places! The characters time travel every day creating unique paradoxical conversations and situations. Gwyn meets the Count Saint Germain at a soiree and he tells her how happy he was about their conversation that took place yesterday. However, it was yesterday for him in the 18th century. It will be tomorrow for Gwyn in her own timeline. Awesome mind bending stuff! During an Audible sale I acquired the firt book in this series, Ruby Red. I was pleasantly surprised with the story and hence I decided to continue with the trilogy. 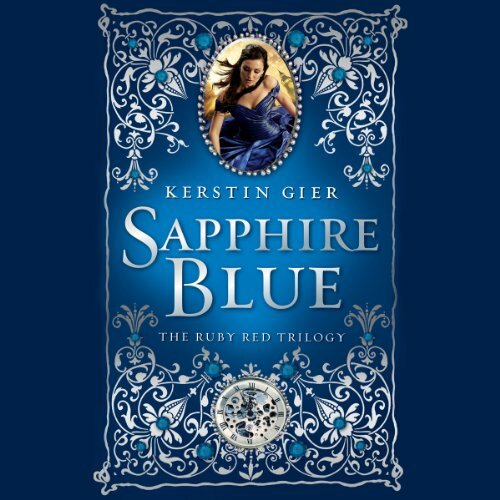 After we left Gwen and Gideon in the last book learning to deal with each other and, in her case, learning about time travelling and its perils, Sapphire Blue opens with a bit more information about Paul and Lucy. While trying to learn more about the cronograph, learn the steps for dancing the minuet and trying to figure Guideon out, Gwen will find herself in the middle of an intrigue that has taken centuries to fully develop. What is it exactly that the Count of Saint Germain did and wants to do with the closing of the circle? While the prologue was quite a surprise, the first chapters of the book were a bit predictable. I enjoyed the adding of Xemerus, the ghost gargoyle, he was a funny and endearing character. As the book advanced however, I started having tiny surprises, actions and actors I did not expect to be put in place and so once again in the series it started slow to pick up by the end. This is by no means the best YA series I had ever read, but it is pretty good nonetheless. First we have the fact that it works with time travelling without recurring to forced science (sometimes admitting that you don't know how something works is way better than inventing some ludicrous theory). Second, while there is the token YA relationship it hasn't been (so far) pressed into the "triangle". This second book in the trilogy had a bit more of pop culture references, that sometimes felt a bit forced; however I will say that it was nice that the Gwen didn't t only like songs from High School Musical, but could sing Memories from Cats. The more I advance in the trilogy the more intrigued I am by the count itself. There is something very dark in all this, and I would really like to know what it is. Another thing that gives extra point is the fashion description, particularly Gwen's dresses. There are things that annoyed me, particularly the fact that the whole "relationship" between Gwen and Gideon develops in less than a week. Sure, they are spending a lot of time together and sure, they are 16/19 but still. I am not very fond of the way Charlotte treats him, or the way she behaves in general, but I can really blame her seeing the way her mother acts. While the end tries to finish in a cliff-hanger, is a very subtitle one, at least it was for me. I do want to know how it all develops and finalizes but I didn't get this urgent feeling to go and the Emerald Green immediately. Marissa Calin continues to do a good job as a narrator. This book seemed to end too soon. looking forward to reading the last in this trilogy. For those who like a little magic, time travel and great characters this is a very fun story. Enjoyed the whole series, but this book I keep listening to over and over. Nothing like a stone gargoyle turned demon to liven things up and get the best punch lines. Reader Marisa Calin has a delightful accent that has me looking for all of her works. Perfect easy summer listening. This storyline is so good. I can't do anything but go to the next book. Narrator has a very nice voice. I really enjoyed this story. I listened all three books straight through. Love the back and forth in time. Wish the heroine was a little sharper and could have a clue. I enjoyed this and will finish the trilogy. however, there was moments in this that I found hard to follow. I found myself having to go back because I found myself confused. it's just because some parts didn't hold my attention as well as the first book had. I found some of the story line predictable, but still enjoyable. the characters grow well and I find myself cheering for our main character, which is why I will continue to the next book.